Welcome to the fourth edition of PHE’s Health Matters, a resource for public health professionals, which brings together important facts, figures and evidence of effective interventions to tackle major public health problems. There are already 850,000 people living with dementia in the UK. An estimated 21 million people in England have a close friend or family member living with dementia. So directly or indirectly, it will soon affect every one of us. Perhaps that’s why dementia is now considered the most feared health condition for people over the age of 55 more than any other major disease, including cancer. As well as the health and social costs of dementia there is growing concern about the economic costs, particularly at a time of tightening budgets. 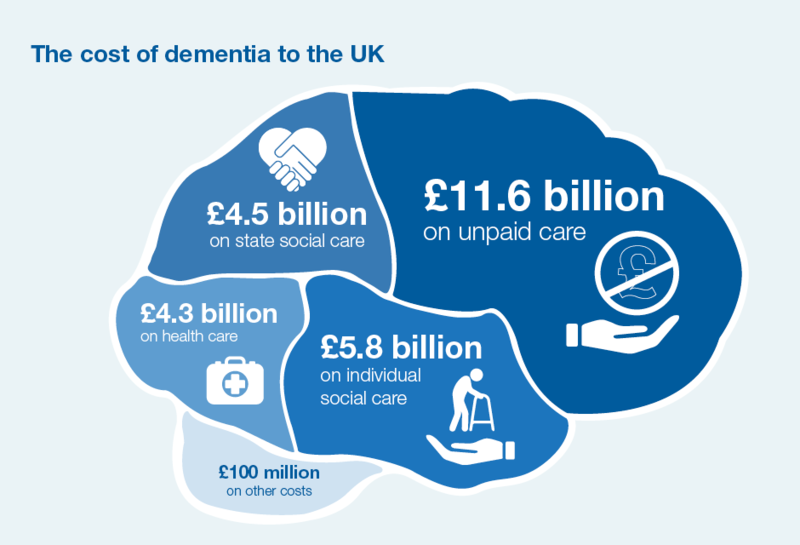 Alzheimer’s Society estimates that the annual cost of dementia to society in the UK is £26.3 billion. This corresponds to an average cost per person of £32,250 annually. This is made up of a cost of £5,300 in healthcare and £12,500 in social care costs. These alarming figures may paint a bleak picture, but we know that people are more likely to live well in their older years if they live healthily in earlier life, particularly during midlife. What most of us recognise as actions to improve heart health, such as not smoking and being physically active, can also contribute to maintaining a healthy brain. Worryingly, a recent survey by Alzheimer’s Research UK found that only a quarter of British adults said they thought it was possible for people to reduce their risk of developing dementia, compared to 83% for diabetes and 82% for heart disease. But when told that a healthy lifestyle may reduce the risk of dementia, two in five people said they would be more likely to adopt a healthy lifestyle specifically to lower their risk of the condition. Modifying cardiovascular risk factors have contributed to a large decline in deaths from heart disease and stroke over the past 50 years. The same could be the case for dementia. Potentially up to a third of dementia cases may be attributable to potentially modifiable lifestyle risk factors. This resource for health professionals and local authorities makes the case for action in midlife to promote healthy lifestyles that can reduce the risk of dementia. 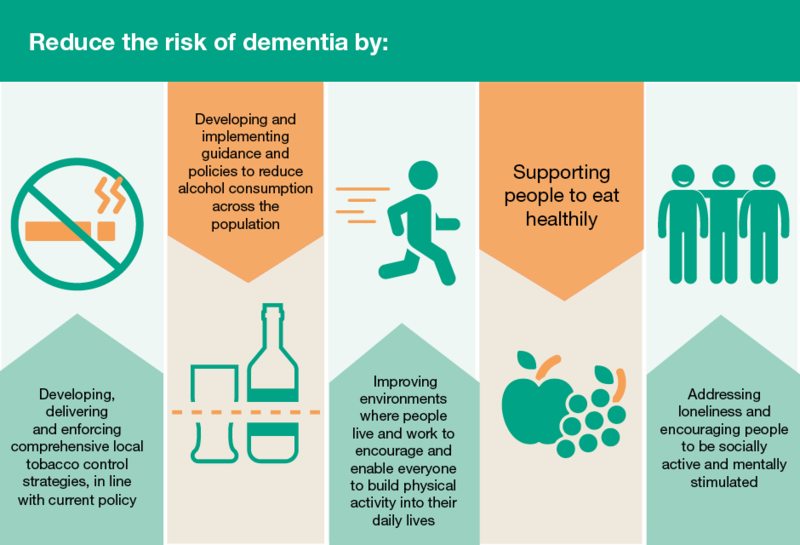 To assist with this, we have created a new suite of Health Matters infographics to help you make the case in your area for dementia risk reduction. This edition of Health Matters sign posts to resources developed for PHE’s new One You campaign which is the first campaign to focus on the health of adults. One You encourages adults, particular those in middle age, to take control of their health to enjoy significant benefits now, and in later life. There is also a big role to play in promoting dementia risk reduction for Clinical Commissioning Groups (CCGs) and local authorities and this is outlined in Health Matters. Using PHE’s dementia profile tool, for example, can help CCGs and local authorities identify local risk factors for dementia such as smoking prevalence, physical inactivity, excess weight and alcohol-related hospital admissions. This will help to prioritise efforts to reduce such risk factors. A great opportunity to promote healthy living is during The NHS Health Check, which is for adults in England aged 40 to 74. The NHS Health Check presents an opportunity to take regular measurements of cholesterol levels, blood glucose, and blood pressure, issues that could lead to or enhance the risk of dementia. In particular the risks are heightened for people with diabetes or pre-diabetes, so ensuring they take advantage of these free checks is significant. Acting now to improve your health in midlife will add life to your years as well as years to your life. 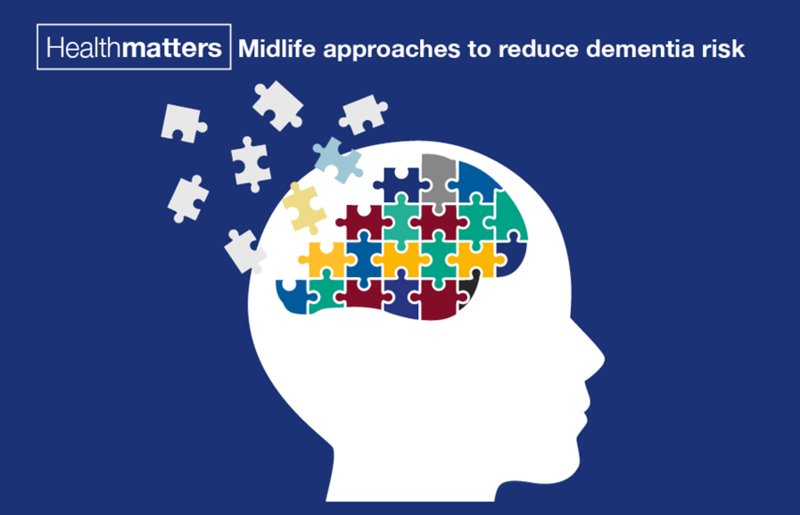 Read the dementia edition of Health Matters for more advice on ways to lower the risks, as well as ways to keep your brain active and challenged throughout life to help protect against dementia. No mention of potential hereditary factors. One of the fittest healthiest people I have ever known has now got dementia he is the latest in quite a long line within his family.